Backed by 25 years of experience in the business, Red Wagon Landscaping specializes in anything from landscape design to general lawn care service. We are proud to serve residents of Tewksbury, MA, and strive to offer you the best possible services when it comes to landscape maintenance, construction and design. As your leader in planting and maintenance, lawn mowing, landscape design and patio creation, you can count on us to provide you with top-notch attention to detail and affordable pricing. If you have a master plan for how you’d like your lawn and yard to look, Red Wagon Landscaping can take your dreams and make them a reality, thanks to our reliable team. Founded in 1990, we use only the very best equipment to ensure we get the job right. Whether you want regular lawn mowing each week or have a grand plan to incorporate a garden complete with walkways and patios, we are here for you. Our landscape technicians are experienced in working with clients from start to finish on designs that meet their every need. When you call on Red Wagon Landscaping to provide landscaping service, you enjoy peace of mind knowing you're getting skilled professionals who will respect your home while there and do the best job possible at the most affordable prices. We offer maintenance services such as seasonal cleanups, mowing, mulch blowing, shrub trimming, curbside leaf removal, gardening and snow plowing. Our construction services range from brick patio pavers and walkways to ponds and waterfalls. We even install and service sprinkler systems to keep your lawn lush and green. 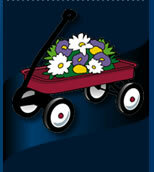 Choose Red Wagon Landscaping today for superior results!